Here's a dilemma: Most psychologists are materialists and consider thoughts and consciousness to be epiphenomena. An epiphenomena is one that occurs parallel to the phenomena under study. It's there, but psychologists can't measure it like behavior, or treat it like a physical object. It's ephemeral, and undescribed. Materialists deal with matter, and thoughts aren't that. Whatever thoughts may be, they are not something that materialists are comfortable with examining. Quantum physics presents a picture of reality that is very different than the one presented by classical, Newtonian physics. Although quantum physics was born over a century ago, some scientists cling to the materialism that grew out of pre-quantum, Newtonian physics. This works well for describing reality most of the time, but occasionally it biases what we consider possible, or restricts our methods of inquiry. Quantum physics has called traditional materialism into question, and Amit Goswami questions materialist explanations of consciousness as well. Quantum physics proves that observers can't be separated from observations. Before an observation is made, little can be said about atomic particles--they only exist as probability waves. Only when observation collapses a probability wave, creating a measurement, can anything certain be said about particles. This finding has baffled many and continues to do so. Goswami believes it implies that consciousness is a force in nature. As such, consciousness is unitary in nature, however people experience themselves as individuals and only occasionally become aware of the One that they are expressions of. For hundreds of years religious mystics have sought direct experience of the One through prayer, meditation, fasting, sitting vigils, etc. For mystics, direct experience constitutes proof. For scientists, experimental results are required. Goswami provides no experimental proof. He doesn't even suggest an experimental path to test his theory. Physicists critical of String Theory acknowledge its elegance, but complain that it lacks testability. Goswami's theory is likewise elegant but lacking testability. He suggests that proof may come through paranormal research, but much of that research is highly controversial. Too many paranormal-leaning scientists have accepted results that stage magicians have easily refuted. In the end, Goswami's ideas are more suggestive than explanatory. 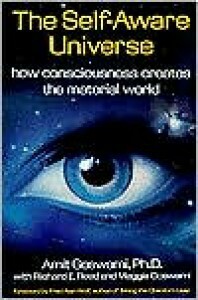 I'd recommend another book with a more convincing explanation of consciousness, but I haven't found it yet.